finest products and the best service for every customer all the time. are satisfied with our products and our service. • Video Output with DVI Connecter. 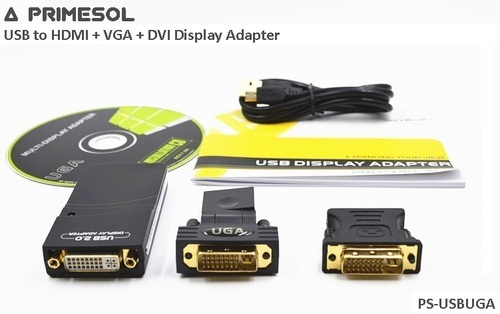 • Support VGA / HDMI Video Output via DVI-VGA or DVI-HDMI Adapter. • Easily Connect Additional Monitors via USB 2.0 Cable. • Quickly Add up to Six simultaneous Displays to a Desktop or Notebook PC with Minimal Configuration without an Additional Graphics Card. • Enjoy Resolutions of up to 1920x1080 at 32-bit color. • Simply Install and Use. • Mirror or Extend a computer display work space. • Allow for Effortless Multitasking. • Bus Powered: No External Power Supply Needs. • Own Industrial Usage: Projector & POS System. Known for supplying, trading and distributing a wide range of Networking Products, Shree Krishna Infotech was established in the year 2009. The product range offered by us consists of Display Port Series, HDMI Series and USB Series. To ensure high standards of quality, these networking products & solution are procured by our procurement agents from some of the reputed vendors of the industry. Owing to their compact design, smooth finish, optimum durability, longer serving life and easy installation, these networking solutions are highly demanded in the market. Offered by us at industry leading prices, these networking products are highly demanded. For meeting the diversified requirements of our valuable customers, we have made strong bonding with some of the trusted vendors of the industry. Based on the financial stability, goodwill, reputation and credibility, our vendors are appointed by our procurement agents through various selection procedures. Through years of experience, our vendors hold expertise in their area of work.